The first of the Essays following appeared in "Scribner's Monthly," in July, 1880; and immediately became honored by the attention of the Medical Press throughout the country. The aggressive title of the paper, justified, in great measure, perhaps, the vigor of the criticism bestowed. Again and again the point was raised by reviewers that the problem presented by the title, was not solved or answered by the article itself. At this day, it perhaps may be mentioned that the question—"Does Vivisection Pay?" 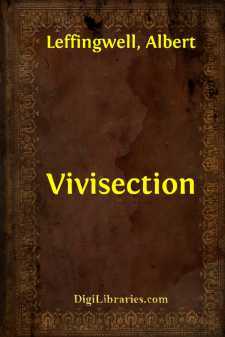 was never raised by the writer, who selected as his title the single word "Vivisection." The more taking headline was affixed by the editor of the magazine as more apt to arrest attention and arouse professional pugnacity. That in this latter respect it was eminently successful, the author had the best reason to remember. With this explanation—which is made simply to prevent future criticism on the same point—the old title is retained. If the present reader continues the inquiry here presented, he will learn wherein the writer believes in the utility of vivisection, and on the other hand, in what respects and under what conditions he very seriously questions whether any gains can possibly compensate the infinitely great cost. "What do you hope for or expect as the result of agitation in regard to vivisection?" recently inquired a friend; "its legal abolition?" "Would you then expect its restriction during the present century?" "Hardly even so soon as that. It will take longer than a dozen years to awaken recognition of any evil which touches neither the purse nor personal comfort of an American citizen. All that can be hoped in the immediate future is education. Action will perhaps follow when its necessity is recognized generally; but not before." For myself, I believe no permanent or effective reform of present practices is probable until the Medical Profession generally concede as dangerous and unnecessary that freedom of unlimited experimentation in pain, which is claimed and practiced to-day. That legislative reform is otherwise unattainable, one would hesitate to affirm; but it assuredly would be vastly less effective. You must convince men of the justice and reasonableness of a law before you can secure a willing obedience. Yielding to none in loyalty to the science, and enthusiasm for the Art of Healing, what standpoint may be taken by those of the Medical Profession who desire to reform evils which confessedly exist?